This article was originally featured in the September 1990 issue of The Medallion. In 1907, a group of enterprising Brenham residents began making butter from the extra cream supplied by area farms. They sold the butter locally. 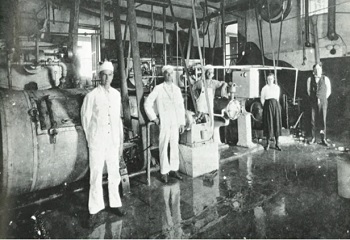 That was the humble beginning of the Brenham Creamery Company, now Blue Bell Creameries, one of the largest manufacturers of frozen snacks in the Southwest and the largest employer in Brenham. “In Brenham, most people had a couple of cows, and they would have more milk and cream than they could use,” said Ed Kruse, chairman and chief executive officer of Blue Bell. The creamery did not begin to make ice cream until 1911, after it converted a nearby abandoned cotton gin into a creamery. The first ice cream the plant produced was handmade in a wooden tub filled with ice. A maximum of two gallons were made per day, and small amounts were sold at the plant to nearby residents. Before stores had electricity, this was the only ice cream available and people didn’t make it at home, Kruse said. Occasionally, store owners from up to 12 miles away would come to the plant to purchase a tub of ice cream for the weekend. Eventually, the company bought a truck to deliver the ice cream to nearby stores. The truck could hold 20 cans of ice cream; 50 pounds of dry ice imported from Houston kept the ice cream from melting. Roads were so bad that the driver would not be sure of returning home the same day. But as roads improved and stores eventually acquired freezers, ice cream sales began to pick up. In 1936, the company bought its first refrigerated truck. Blue Bell Creameries, Inc. is the name that Kruse’s father. E.F. Kruse, gave the company in 1930. Blue Bell comes from the name of the wildflower that was common in East Texas at the time. In 1919, E.F. Kruse was still serving in the Army when Brenham Creamery Company asked him to become the manager. His salary was $70 a month, but he didn’t cash his paychecks for six months because the company was losing money, his son said. Only four employees, plus E.F. Kruse himself, ran the first plant. His sons, Ed and Howard, began working part-time at the plant in 1941. Ed was 13 years old. “I made ice cream sandwiches. I’d quarter a two-gallon block, then put it back in the freezer again before it melted. Later I’d take it out, slice it into small portions, slap two Nabisco cookies around them and bag them, all by hand,” he said. Ed Kruse went to college and returned in 1951 to take over as company manager, secretary, and treasurer. In 1954, his brother Howard joined the company full-time and was named assistant manager in 1956. Today, he is company president. 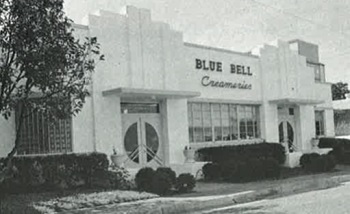 Over the years, Blue Bell has kept up with modern technology and produces a wide variety of flavors. The company’s ice cream products have become so popular in recent years that is has opened branches in most of Texas’ major cities, two branches in Oklahoma, and two in Louisiana. The home plant in Brenham recently has been listed in the National Register of Historic Places for its important role as an agricultural processing facility. It incorporates building elements from the American Cotton Gin Company and includes a one-story principal building in the Art Moderne (c. 1935) style.